We value Each customer and strive for any purchase of products in our Nr1 Supermarkets to bring you even more positive emotions! What discounts are available to users of “Nr1” discount card? What is “Nr1” discount card? 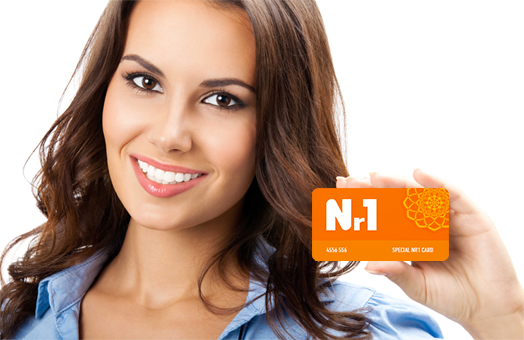 “Nr1” discount card is a unique opportunity to enjoy discounts of up to 5% on goods purchased in all “Nr1” supermarkets. How to use “Nr1” discount card? Use of “Nr1” discount card is simple and convenient as you just need to show it to the cashier at any time of scanning purchased goods until closing the receipt. The software automatically recalculates the sum of purchase, taking into account your discount. At the same time certain goods that are subject to the discount of 5% or greater is not covered by the discount card.